Americas Society Gallery does not accept unsolicited submissions and materials. Our staff is not authorized to receive or review artist or exhibition proposals. 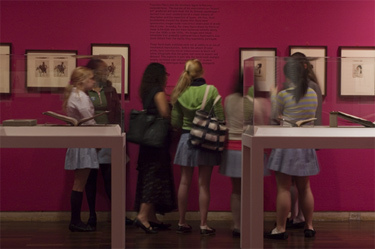 The Visual Arts program boasts the longest-standing private space in the U.S. dedicated to exhibiting and promoting art from Latin America, the Caribbean, and Canada; it has achieved a unique and renowned leadership position in the field, producing both historical and contemporary exhibitions. The Visual Arts program presents three exhibitions annually, each accompanied by a series of public and educational programs featuring outstanding artists, curators, critics and scholars. The Visual Arts program produces exhibition catalogues as well as scholarly publications, including the seminal work, A Principality of Its Own: 40 Years of Visual Arts at the Americas Society. Want to attend Visual Arts events for free and gain other membership benefits? Sign up for an Americas Society membership today! Please note the gallery is closed Friday, April 19 and Saturday, April 20 for the holiday. The gallery will resume normal hours on Wednesday, April 24. Thank you. The exhibition Victoria Cabezas and Priscilla Monge: Give Me What You Ask For is made possible by public funds from the New York City Department of Cultural Affairs in partnership with the City Council, and by the New York State Council on the Arts with the support of Governor Andrew M. Cuomo and the New York State Legislature. Additional support is provided by the Export Promotion Agency of Costa Rica, PROCOMER, and by Mex-Am Cultural Foundation, the Smart Family Foundation of New York, Judko Rosenstock, The Cowles Charitable Trust, and an anonymous donor. The exhibition and publication received in-kind support from TEOR/éTica, San José, Costa Rica. Americas Society gratefully acknowledges the support from the Arts of the Americas Circle members: Estrellita Brodsky; Galeria Almeida e Dale; Kaeli Deane; Diana Fane; Alexandra García; Isabella Hutchinson; Carolina Jannicelli; Vivian Pfeiffer and Jeanette van Campenhout, Phillips; Luis Oganes; Roberto Redondo; Erica Roberts; Sharon Schultz; Herman Sifontes; Axel Stein; Edward J. Sullivan; and Juan Yarur Torres. The Society’s Visual Arts department, dedicated to fostering a better understanding of art in the American regions beyond U.S. borders from the pre-Columbian era to the present day, produces gallery exhibitions, illustrated catalogs, and a variety of public programs. The quality of our exhibitions attests to the diversity and heritage of the Americas, and upholds the mandate of the Americas Society to foster a better understanding of the art made in these regions from the pre-Columbian era to the present day. The visual arts program boasts the longest-standing private space in the United States dedicated to exhibiting and promoting art from Latin America, the Caribbean, and Canada. Americas Society is recognized for its catalyzing role in establishing Latin American art markets in the United States and helping to expand the notion of modernity in the western hemisphere. The success of the department is rooted in its role as not merely a consecratory venue, but also as a platform for new artistic visions and achievements from throughout the Americas. Curated by Miguel A. López, codirector and curator of TEOR/éTica (San José, Costa Rica), this exhibition brings together for the first time the distinct, yet intertwined bodies of work created by two Costa Rican artists from different generations: Victoria Cabezas (b. 1950) and Priscilla Monge (b. 1968). Each of them is acknowledged as a major figure within her respective generation. Both artists investigate their own subjectivity in relation to social-political economies, sexual violence, and gender roles and stereotypes. They question the perception of the body as well as normative ideas of masculinity and femininity in Latin American cultures. Learn more about the exhibition. Meet the artists and learn about the feminism imbued in the exhibition. The Visual Arts program boasts the longest-standing private space in the U.S. dedicated to exhibiting and promoting art from Latin America, the Caribbean, and Canada; it has achieved a unique and renowned leadership position in the field, producing both historical and contemporary exhibitions. The Visual Arts program present three exhibitions annually, each accompanied by a series of public and educational programs featuring outstanding artists, curators, critics and scholars. Explore our past exhibitions below, and view a timeline of Visual Arts exhibitions dating back to 1967. The gallery is free and open to the public. Hours: Wednesday through Saturday, 12–6 p.m. Learn about our new exhibition Victoria Cabezas and Priscilla Monge: Give Me What You Ask For. View a map of this location. Take the train to 68th Street/Hunter College or the and train to Lexington Ave/63rd Street. We are located on the northwest corner of East 68th Street and Park Avenue. The Visual Arts department offers a variety of beautifully illustrated catalogues that chronicle past Americas Society exhibitions. The Visual Arts program has demonstrated a strong commitment to education and public engagement in its 50 years of history. Visual Arts events are free and welcome all audiences, including families, students, teachers, and scholars. Public programs and bilingual tours stimulate an interest in learning about art of the Americas among diverse communities. 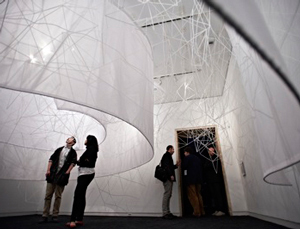 Visual Arts offers regular private group tours of the exhibitions. Tours cater to all levels of learning, including K-12 and university classes, as well as adult groups, and are available in both English and Spanish. Americas Society has built a partnership with CUNY, Hunter College. Hunter’s Cultural Ambassador works with Visual Arts to welcome students to exhibitions and public programs, as well as special events organized for the students. In addition to a commitment to foster education and encourage higher learning, the Visual Arts department provides internships for future arts professionals. To schedule a tour for your class or group, please contact Carolina Scarborough at cscarborough@as-coa.org. The Arts of the Americas Circle is a dynamic group of collectors and arts lovers, involved in historical, modern, and contemporary art and culture from the region. All funds provide crucial support for our Visual Arts exhibitions, publications, and public programs at Americas Society throughout the year. To support our Visual Arts program lead by Gabriela Rangel, the Americas Society requests Arts of the Americas Circle patrons to make an annual contribution to provide critical financial support for the organization. As a patron of the Arts of the Americas Circle, you will be invited to join a selection committee responsible for selecting two to three exhibitions proposed by the Visual Arts Department each year. In addition, patrons will also receive invitations for special events exclusively organized for the Circle, including an intimate party held annually, visits to art fairs, galleries and artist’s studios, special book editions and conversations with artists, curators, and collectors. For more information about the Arts of the Americas Circle, please contact Carolina Scarborough at cscarborough@as-coa.org.